He was a Good Cat. Oh no. My sincere condolences, and rest in peace, Mr. Abbie. I am so sorry you had to say goodbye. Thank you for sharing your life with us, Abbie. Oh. :( I'm so sorry. I loved your words and your cat perspective and insight. Be a good pirate now. I feel I must say something here. 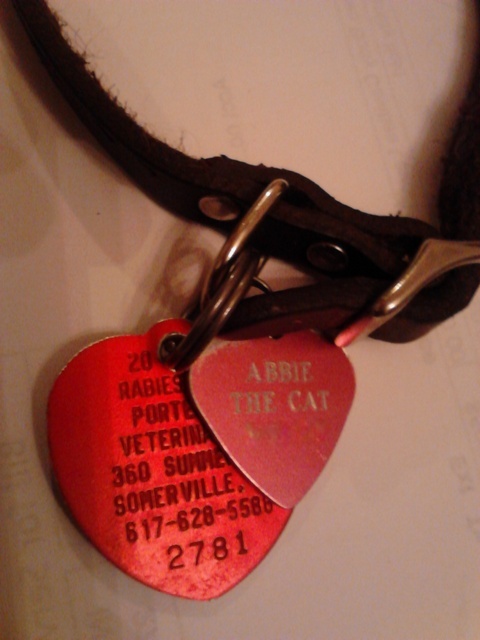 I lost my second and thus far last cat in January, and have been a fan of Abbie's for nearly a decade. But I simply can't think of what to say. Abbie the Cat had, has, and will always have a Posse in Dallas. I am very sorry for your loss. I hope Abbie will live on in your heart, as he will for most of us who have followed this blog. You will be missed, Abbie. You were the most awesome cat on the internet, dude. My heart is broken for the people that you had to leave behind. They will have a big sad without you for a very long time. Thank you for sharing your cat world with us for all these years. You could type way better than my cat. I am so, so, sorry. Safe journey, Abbie. I'm so sorry. He was a good cat, and I'm glad he had a guy who loved him as much as you did. He leaves a hole in the world but I will always come back to his blog when I need a smile. My favorite memory of Abbie is when he tried to mail Martha to Canada, disguising the presence of a cat in the box by writing "do not open, rare complaining bird inside." Thanks for this blog. Thank you so much for sharing Abbie with us. Please tell Miss Martha hello for us, Abbie. And remind us all to be people like your Guy, the Nice Lady and your other human family -- striving to be worthy of fine cats like you. I'm so sorry. Abbie and Martha were, and are, the first and best of all the cats I met on the Internet. Thank you for sharing your keyboard with them. I'm so sorry for your loss. Thank you so much for sharing your cats and your love. I'm so sorry for your loss. I've loved your cat just a tiny fraction as much as you have and I feel very sad indeed at his passing. I hope you find comfort where you can. I am so grateful to have known Abbie's work, and that of his Guy, Rob, as well. Abbie will be very, very missed. I'm so sorry, and I'm sending all the love in my heart. We have been avoiding commenting because, well, what do you say when a good cat goes into the shadows...sorry for your loss just doesn't seem enough. We're sorry for our loss too, Abbie was, even though we never met him, loved by this family too. Thank you Abbie, I am sad I will not be able to find any more new stories from you. Thank you, Abbie's Dad, for sharing him and Martha with us. Be well. We still sing the pirate songs with our feline companions, the ones that Martha and Moon and Abbie (and the other Abbie) and Rosie and Bodhi and Darjeeling and Bonnie and Clyde taught us, before they left… we remember them and their songs, and we will still sing them as long as we are able. Thank you so much for helping Abbie with her blog. It has meant surprisingly much to us. PS: Abbie was one damned fine writer, and was a lucky, lucky cat to have found such a gifted and thoughtful Editor. All the best to you, Rob. Somewhere, elsewhere, Queen Iau has Her hands full with the new arrival. Our deepest sympathies, Rob, on something we also went through earlier this year. Diane & I will miss Abbie and his wry observations on life. The singer is gone, but his songs remain. Thank you for sharing. I'm going to read some of them now. He was an excellent cat. I only met Abbie and Martha one time -- long, long ago. And yet, they have become a part of what makes me, me. Indeed, I'd not been to this blog for some time -- thus my surprise (and sadness) to read of Abbie's passing. I came here from a silly cat video -- someone had dressed their cat up with a shark outfit, and had him surfing on a Roomba. And, while that may not have been "The Guy" who made it happen, it certainly reminded me of him and his feline troupe. I guess all good things must come to an end, but that doesn't make it better, or keep the tears from coming. Just saw this sad news. I am so sorry for your loss. Thank you so much for sharing Abbie and Martha with the world. They were Fine Cats indeed. I'm late to the ball game, but I wanted to express my sincere condolences on the loss of Abbie - who appeared to be a simply spectacular feline! I will miss his stories. OH MY GOD!!! SUCH A PERSONALITY. REST IN PEACE!!! I have wandered through your life in the last 11 years and alternately laughed out loud and wiped away heartfelt tears. Tonight, working late, I thought to check in on an old friend - only to find this news of his passing. If there was anything that Abbie taught us it was to appreciate the absolute contentment contained in "now". He never looked too far back, he never looked too far forward. He appreciated "now" (and a sunny spot to doze and a piece of fish). Not a bad outlook on life. I think I shall try a little harder to live by Abbie the Cat's ideology. I liked your blog. Great job to attract the visitors. Lots of thank from my site. It's been two years and I still come back to this blog when I need an Abbie fix. 3 year ago, but I am so sorry about that. I come back to this blog a lot. I miss Abbie.